This Old Timer Boot Knife is a great tool to take along on hunting trips or wear as an everyday carry. 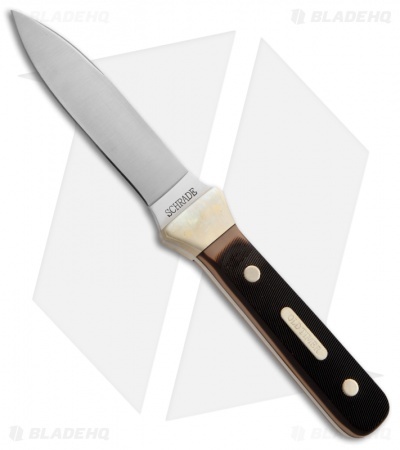 It features a stainless steel satin finish single edge dagger blade. The full tang blade is clad with textured polymer composite scales and polished brass nickel bolsters. 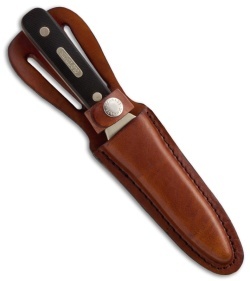 The Boot Knife comes with a leather sheath. This is an "Old Timer" in the most literal sense of the phrase. This is a "self-defense" dagger from the "old-school" set of tools. This may sound odd, but the knife reminds me of the daggers Riverboat Gamblers of the 19th century once carried. While useful for some cutting chores, this is a "purpose built" knife. Designed primarily for stabbing and fending off an attacker, this knife has enough weight to make it penetrate after an offensive/defensive thrust. I plan on finding a flexible, expanding strap with a Velcro fastener to fasten the sheath to my calf. This will permit discreet carry. (Discretion IS the better part of valor, you understand). No one should be forced to be a victim and some tools can be used to prevent such aggression.